Brennen's garlic bread is a classic in New Orleans. 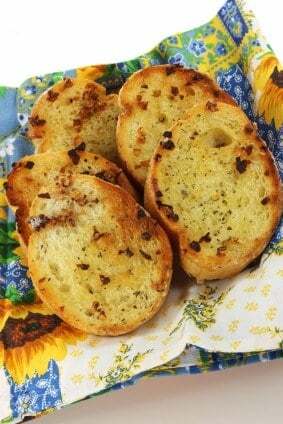 The secret to this wonderful tasting bread, is rubbing the outside of a loaf of bread with a piece of garlic that has been cut open lengthwise. Split loaf, and spread over the melted butter. Sprinkle on the remaining ingredients. Finely chop the garlic cloves, and sprinkle those on top of the bread. Bake at 350 degree for about 8-10 minutes, or until nice and golden brown. This was a hit at my dinner night with my friends.